Top quality one inch horizontal aluminum window covering for commercial applications. 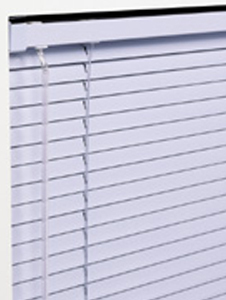 The Bali Classics Mini Blind is a high quality mini blind that has been an industry standard for over 20 years. It provides excellent performance for very large windows and has a solid record for long lasting dependability. Available with a wide range of commercial options, the Bali Classics is a great choice for any commercial application. The Bali Classics headrail system is also used for our Special Shape, Dual Headrail Skylight and Incline Wire mini blind products. • Headrail: .025" thick phosphate treated steel. U-shaped, 1" high x 1 9/16" wide. All hardware enclosed in the headrail. Tilter: Clear polycarbonate, nylon gear acetal thermoplastic housing designed for smooth low friction operation. Field replaceable. Cord Lock: Stainless steel wear and floating shaft type locking pin. Crashproof. Field replaceable. Drums & Cradles: Provided with each ladder, all mechanically locked into headrail. Installation Brackets: Standard hinged cover end support brackets of phosphate treated steel with prime coat of polyester baked enamel in color to match headrail. Slats: Aluminum alloyed for maximum strength, flexibility and resistance to corrosion. Nominally one inch wide, actual .991 inch (+.044 or -.000 inch). Standard thickness is .006", optional .008". Louvers shall have a pre-coating treatment to bond the polyester baked enamel finish coat the features our Advanced Finishing Technology (AFT) which provides a smoother, harder, less porous surface that provides anti-static performance to help repel dust and anti-microbial qualities to help resist fungal and bacterial growth. b. Perforated - slats are perforated with an openness factor of 6%. Available in 6 colors: White Satin, Alabaster, Brushed Aluminum, Smokey Gray, Char Brown, and Black Satin.